Remember a bunch of years ago when digital photo frames first came out? People were obsessed with them and they flew off store shelves, but then the shine wore off and people got bored. Prepare to have your passion reignited, because the AURA Frame is like no other digital photo frame you’ve ever seen before. Sure it displays images on a gorgeous high-resolution screen, but that’s just the tip of the iceberg because it also has awesome futuristic features like unlimited storage, face recognition, and gesture-based navigation! UNLIMITED PHOTO SHARING – You and your family can share unlimited photos to the frame without subscription fees. INTELLIGENT PHOTO CURATION – Facial recognition software via the Aura app identifies your closet relationships and sends photos to your frame automatically. 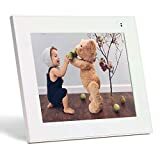 STUNNING CLEAR DISPLAY – Jaw-dropping clear 2048×1536 resolution display ensures photos display in vibrant clarity, presenting family photos beautifully. Rotate for vertical or horizontal display.